Number Six At 50: The 50th Anniversary Of 'The Prisoner' The series, about an ex-spy chafing against his imprisonment in a sunny, seaside village, was one of the first shows to end with a finale that sharply divided viewers. 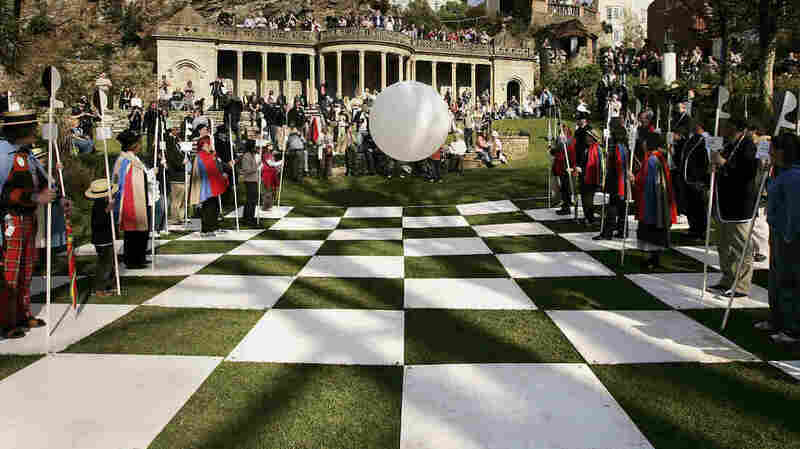 In 2007, members of "SixofOne" — a fan club of the television series The Prisoner — re-enacted the game of human chess from the episode "Checkmate," while the sinister Rover (center) looked on. It was a little bit James Bond, a little bit George Orwell, and — eventually — a whole lot of Franz Kafka. If you tuned your telly to the British network ITV half a century ago tonight, you were greeted with a shot of a cloudy sky, a crack of thunder, and a man driving a tiny sports car straight towards the camera. If you were British, you likely recognized the driver as the actor Patrick McGoohan; he'd just starred in four seasons of the spy show Danger Man (known as Secret Agent over here). ... And awakens in a ridiculously picturesque Italianate seaside village known only as ... the Village. (Actually the North Wales tourist hamlet of Portmeirion.) He, like all the other residents of the Village, is a former spy, imprisoned there to either protect, or extract, the information he's accumulated over his long, clandestine career. Everyone in the Village is forbidden to use their real names, and are instead assigned a number. Our hero, we learn, is Number Six. The person in charge of the day-to-day running of the Village is known only as Number Two — a position filled by a different actor each week. In a dialogue that would run over the opening credits of most of the show's subsequent episodes, Number Six queries that week's Number Two relentlessly. And fruitlessly. Six: What do you want? Six: Whose side are you on? Two: That would be telling. We want information. Information. INFORMATION. Six: You won't get it. Two: By hook or by crook ... we will. Six: Who is Number One? Six: I am not a number! I am a free man! "I will not make any deals with you. I've resigned. I will not be pushed, filed, indexed, stamped, briefed, debriefed, or numbered!" Maybe not, but what he will be, over the course of those 17 episodes, is constantly surveilled and cruelly interrogated. So far, this all might sound like some pretty straightforward James Bond stuff. But that's because I haven't told you about Rover yet. Rover is the Village security system — a giant, white, round death-balloon that chases anyone who steps out of line and smothers them. It's only one of the series' many striking, and exultantly weird, visual elements that are still referenced in pop culture. Homer attempts to escape The Island in The Simpsons episode "The Computer Wore Menace Shoes." ... No, yeah, lots of people didn't. They wanted clear answers — Where WAS the village? Which side ran it? Who WAS Number One? — but McGoohan gave them symbols and speeches. For fans, it was more than enough, and they continue to unpack those symbols and speeches today. For casual viewers, though, it was infuriating. They wrote outraged letters — McGoohan claimed he had to go into hiding for a while. Since then, the finales of shows like Lost, Dexter, True Blood and most recently Twin Peaks: The Return have sharply divided viewers. But 50 years ago, that was a brand-new phenomenon — The Prisoner may have been the first television show to generate enough passionate devotion for its finale to split its audience into fans and haters.